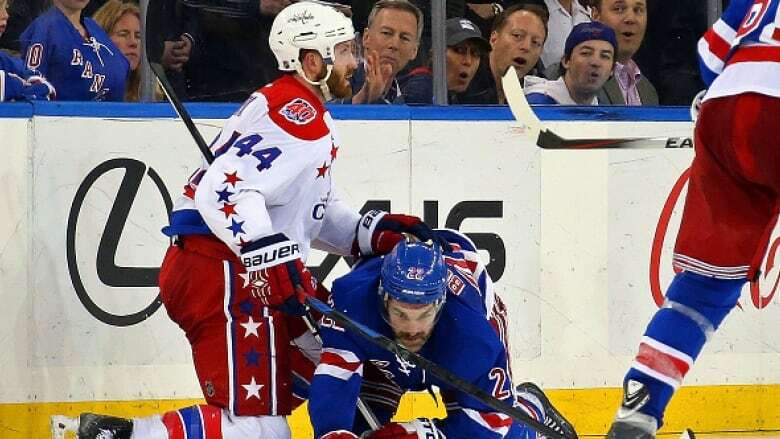 Despite the Washington Capitals' season being over, defenceman Brooks Orpik could face discipline for a huge hit that took fellow blue-liner Dan Boyle of the New York Rangers out of Game 7. Boyle did not return following the third-period hit and the 38-year-old was visibly shaken as he made his way off the ice. Rangers coach Alain Vigneault had no update on his status, but said that the team would know more tomorrow. Karma seemed to have an answer to Orpik's dangerous-looking hit, as the puck deflected off him and found the stick of Rangers centre Derek Stepan. The game winner followed immediately after to seal a 2-1 overtime victory for New York and eliminate Washington, which blew a 3-1 lead in the best-of-seven Eastern Conference semifinal.